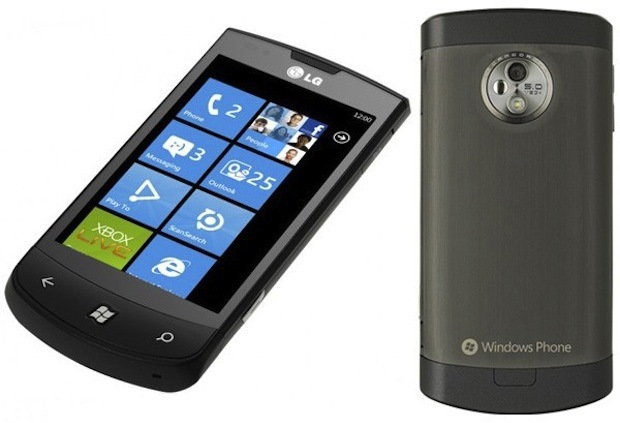 In the hours before Microsoft’s Apple challenger launched, a slew of Windows phones surfaced. Then MS revealed a total of 10 phones for 30 countries. Most look like competitors to the current iPhone, not next year’s. Microsoft’s launch vessel for its prestigious Windows Phone 7 OS is one heck of a leaky ship: In the hours before the event data on handset after handset has leaked out. Then MS revealed a total of 10 different handsets, destined for 30 nations worldwide. Here are the ones worth knowing about—and whether they might chip away at iPhone’s dominance. 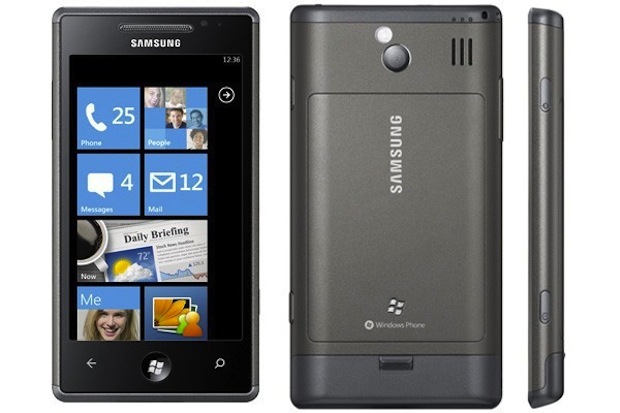 The Omnia 7 is Samsung’s Windows 7 phone that’s destined for Europe. It has 4-inch screen device, bearing that Super AMOLED screen that people have been banging on about for a while–since it puportedly bests the iPhone’s IPS LCD unit (even though he can just still read the iPhone’s display in sunlight, but the OLED is a blank). Sadly it has just a 1GHz Qualcomm chip as its CPU, placing it as a late-arriving competitor for this year’s iPhone 4, with the new unit now only 6 months away. There’s 8GB of storage, and a 5-megapixel rear-facing cam with a flash that can record 720p video. It’s basically a slightly larger-screened iPhone copy. The Omnia’s interesting because AT&T is featuring the Samsung Focus, which seems to be essentially the same phone, with an AMOLED screen, re-housed in a curvier frame and aimed at the U.S. market. The presentation made much of the Focus’ 9.9mm depth–the thinnest Windows 7 phone (still 0.6 mm, or nearly 7% fatter than the iPhone 4). A 3.8-inch LCD screen with 800 by 480 pixel resolution places this unit in even more direct competition with the iPhone’s 3.5-inch 960 by 640 unit. There’s 16GB of storage aboard, Bluetooth 2.1, Wi-Fi, compass, proximity and orientation sensors, and a rear-facing 5 megapixel cam that can shoot 720p video footage. It also streams DLNA content over your network to your compliant media devices (such as a PS3) using a system dubbed Play-to, that sounds like a competitor to Apple’s upcoming AirPlay. These devices all leaked out in different places, courtesy of AT&T’s website and Australia’s Telstra network. They’re all variations on a theme that the Omnia and Optimus typify. 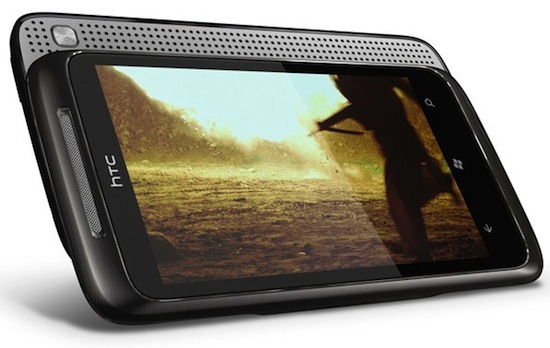 HTC’s Surround is a 3.8-inch WVGA unit with a 1GHz Snapdragon CPU and that same 5-megapixel camera resolution with 720p video powers. It sets itself apart from its brother phones by being media-centric: The case has an integrated kickstand, and the pop-up sliding speaker system makes the most of Dolby Mobile and SRS Surround sound technologied. 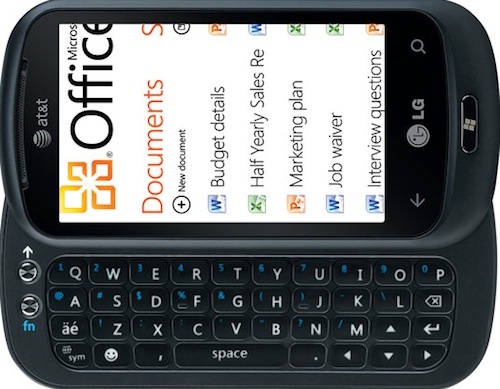 The LG Quantum is a landscape-format slider phone with full QWERTY keypad in a chiclet-format that’ll please many physical keyboard fans. It’s a quadband EDGE and triband HSPA handset with 16GB of storage aboard, a 3.5-inch WVGA screen and the same 1GHz CPU and camera setups as the other phones here. It too supports the same DLNA media-streaming as the Optimus 7. There’re a bunch of other phones too, with HTC’s massive 4.3-inch screened HD7 as one stand out, along with Dell’s peculiar little vertical-sliding QWERTY unit. So what can we learn from all this? Microsoft isn’t as good at keeping control over its news sources (or actually doesn’t care about leaks) as Apple does. Also that there’s going to be a relatively large clutch of phones available from October 21st (November 8th in the U.S.), when Windows Phone 7 officially arrives–enough to meet a few different price points and appeal to a broad swath of potential smartphone customers. MS is taking the Android route to compete with the all-singing, all-dancing iPhone, and differentiating the different units with subtle end-user targeting (media consumption on the Surround, business on the Quantum). The core features of the phones are, however, very similar indeed. And though Microsoft’s UI is very slick, and its business integration will tickle the fancy of many an exec, the actual hardware running these first phones is going to be quickly outclassed by the iPhone 5, and is already beaten by several Android handsets (including some megapixel camera monsters). Did MS set the bar too low? Update: AT&T’s Ralph de la Vega showed the Samsung Focus, HTC Surround and LG Quantum on stage during the MS press event. He gave a little extra sizzle to the information we’ve already gathered about Windows 7 phones, noting the minimum spec is a 1GHz processor (and side-stepping the fact that all three phones actually operate at 1GHz) but his biggest piece of news was that the three units that’ll be on sale first all cost users $199. The Focus will hit stores November 8th, and the other two “a few weeks later”.